Sony Cyber-shot DSC-RX100 II lens review: does it live up to the Zeiss name? After the success of the genuinely pocketable Cyber-shot DSC-RX100, Sony has added a second mode with a slightly revised specification to run alongside. It adds a number of refinements including a new 20-Mpix Exmor-R (back-illuminated) 1-inch type CMOS sensor, a hotshoe with provision for an electronic viewfinder, Wi-Fi with NFC technology and a tilting rear 3.0-inch 1.2M-dot LCD. 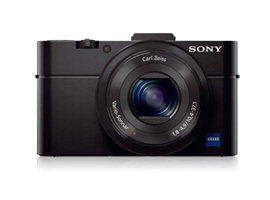 At $750 the RX100 II is targeting the top end of the market but as with the original model it remains attractively compact despite the larger than average sensor and the same retracting Carl Zeiss Vario-Sonnar 1,8-4.9/10,4-37,1 (28-100mm equivalent) zoom. 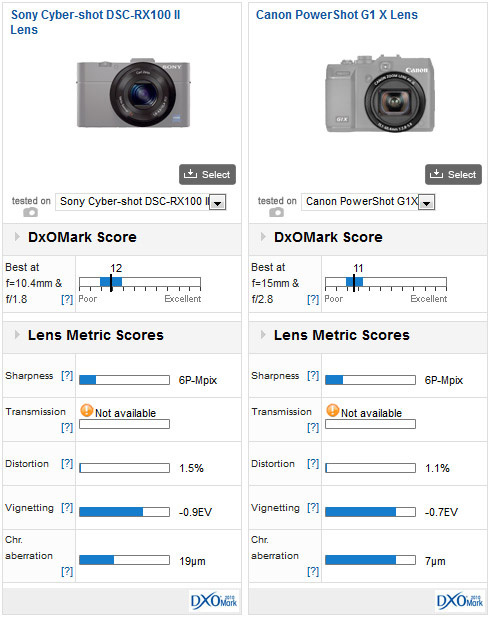 Achieving an overall (average) DxOMark lens score of 12 points, the Zeiss lens is a good performer overall, however the performance varies considerably over the zoom range (indicated by the wide score gauge, above). 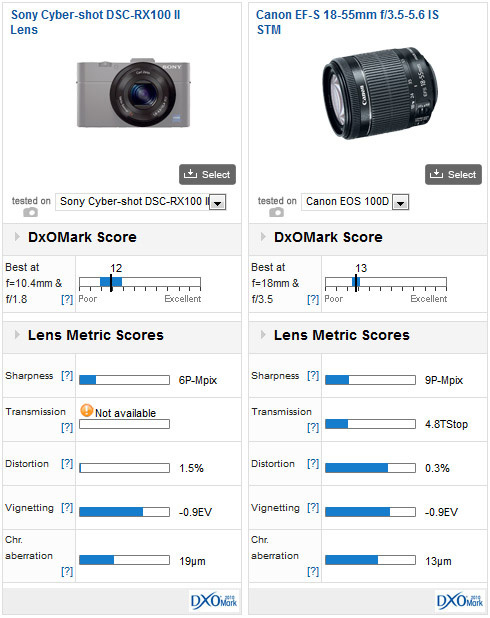 In fact, the DxOMark lens score varies from 6-18 points over the range of focal lengths, with the best optical performance achieved between 28mm to 70mm over the first two stops (f/1.8 – f/5.6 effectively). At all other settings, the lens performance drops below the 12-point average. 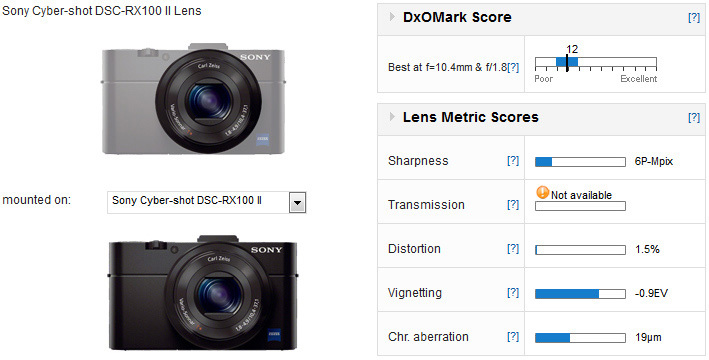 All the same, a 12 point score indicates good optical quality given the sensor size. Throughout the range, sharpness is good in the center of the frame and vignetting is reasonably well controlled (though still quite heavy in the extreme corners at 28mm f/1.8-2.0). Downsides include a rather lowly 6P-Mpix sharpness and inconsistent sharpness across the frame (in some instances, the difference equates to as much as 25% across the image field). As with many rivals, distortion is corrected in-camera for JPEGs, but not with Raw files. Barrel distortion is strong and noticeable at the wider-end (between 28-42mm) but otherwise well –controlled after that. More of an issue is the high levels of chromatic aberration, which is noticeable at either end of the zoom range (and in some cases represents as much as 8-pixels in-width on screen). Comparing the Sony with another large sensor compact, the Canon G1X, the Zeiss lens performs similarly overall which is encouraging given Canon lens covers a similar, though slightly wider zoom range of 28-111mm (35mm equivalent). The Zeiss lens has the edge in sharpness at 28mm over the f/1.8 to f/4 aperture range but averaged out the 6P-Mpix score for both models is somewhat disappointing. It’s worth remembering though the Canon sensor is a 15Mpix unit, meaning the sensor and lens combination is more efficient, and that noise levels will be lower, again aiding the Canon in our test results. As for Distortion Vignetting and Chromatic Aberration, the Sony can’t quite match the Canon lens (particularly with regard to Chromatic Aberration). While we’re not suggesting the Sony would replace a DSLR on a day-to-day basis, it may be of interest to compare the two. In this comparison, we’ve pitched the Sony against the similarly priced Canon EOS 100D / SL1 and a kit zoom with a similar (though not identical) range, the EF-S 18-55mm (29-88mm equivalent) f/3.5-5.6. Despite the obvious differences between the two on a technical level, the Sony comes quite close to matching it in image quality. While the Canon has better edge-to-edge sharpness, lower chromatic aberration and very low levels of distortion, it is hardly surprising. In low light levels though the Canon with its larger sensor (and lower noise) would easily outperform the Sony. Although it looks expensive and the optical quality isn’t perhaps quite what it could be, particularly with regard to sharpness and chromatic aberration, given the small size and inherent portability, the Sony Cyber-shot DSC-RX100 II a very satisfying and capable camera.